I don't know if you've seen the leaked cast list from the Spider-Man: Homecoming movie, but I decided that I'm going to do a few Amazing Spider-Man key issues from the names that appear on that list. 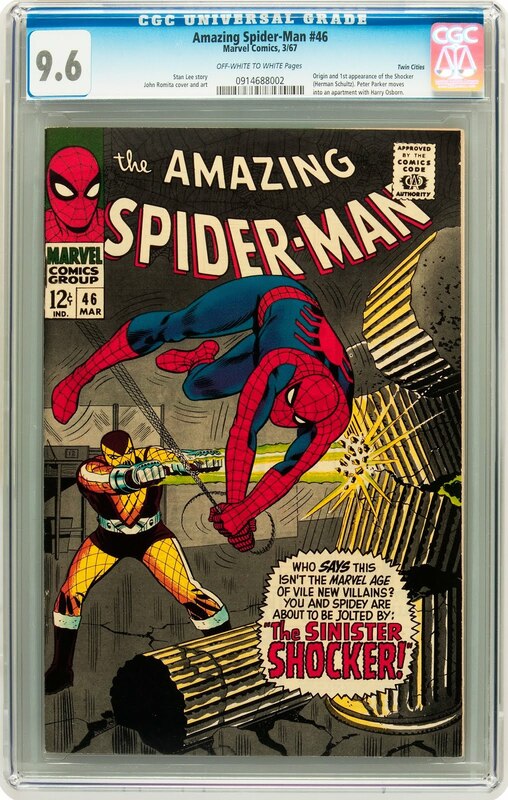 The first issue I'm going to attack is Amazing Spider-Man #46, the first appearance of Shocker. There was some concern that the leaked list was a fake, but with recent photos from the set of the movie, the list has more credibility. 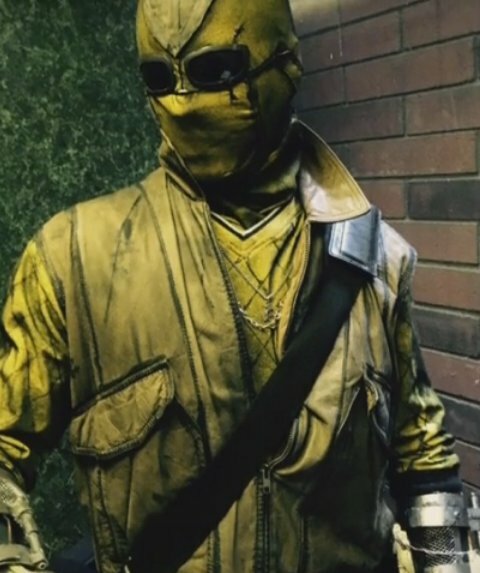 Here you can see what looks like Bokeem Woodbine all decked out in his Shocker costume. It's not exactly like it is in the comics, but it's a lot closer than some others that I've seen. Anyway, we'll see the costume in all of its glory when the movie hits theaters next summer. The Shocker is another of the long list of characters that was created by Stan Lee, along with John Romita Sr., during the Silver Age. When I was a kid I thought that Electro and Shocker had very similar powers. I figured that shock had more to do with electricity than what his powers really are. Essentially, The Shocker has a pair of gauntlets that he made that gives him the ability to shake and vibrate objects, not shoot bolts of electricity like I thought all those years ago. He originally made the gauntlets to open up safes and steal his fortune. Before he became The Shocker, Herman Schultz was a just a two bit thief that landed himself in the big house a few times. While in jail, he came up with the idea to create a machine that could open any safe with vibrations. He used his creation to break out of prison and become the super villain that we know him as now. He also has a device that he used to deflect the punches of anyone that he's fighting, like Spider-Man in this issue. That's about all there is for key issue worthiness in this issue. Well, I guess there is one other small key issue note to mention. In this issue, Peter Parker moves out of the house he shares with Aunt May, and moves into an apartment with his best bud Harry Osborn. That's it, nothing too important, but definitely a big step in the life of young Pete. Since the cast list leaked, there has been an increase in demand for this comic. There have been a lot of sales over the past two weeks or so, but prices haven't really shot up as high as some other comics I've seen after a confirmation of a character appearing in a movie. 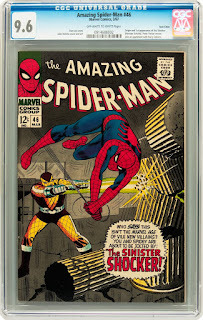 I have noticed a lot more copies coming up for auction on sites like eBay, so maybe the market is getting diluted and it's keeping values down. As far as high grade copies go for this issue, there are a few. According to the CGC census, of the 842 copies already listed, 455 are graded 8.0 VF and higher, with three topping out at a 9.8 NM/M. There are quite a few Signature Series copies as well as a handful of Restored copies too. With the census being that low, you can bet that there are going to be a lot of raw copies out there that you can probably still get a deal on and send in to get graded yourself. If you'd rather buy already graded, then you can still get this comic for a good deal. The most recent sales for some grades are only slightly higher than they were before the cast list was leaked. There has definitely been an increase, but nothing crazy so far. The most recent sale for an 8.5 VF+ went for $350, which is only up about $100 from sales at the end of last year, and 9.2 NM- have seen a slightly larger increase in value. The last sale of $750 has increased over $250 in about that same time span. There was one lucky SOB that nabbed a sweet 9.6 NM+ for only $195 on the 3rd of this month. Don't be expecting to find deals like that for this book anytime soon. For all of you variant hunters out there, there is a UK version of this comic too. So far, there have only been 8 copies graded by CGC. How many copies of this variant are out there is beyond me, but I'm sure it's much lower that the US version. There is also a Mexican edition available, but I have even less information on that one that I do the UK version. Either way, these are both hard finds. I could only find one of each for sale on the world wide web.